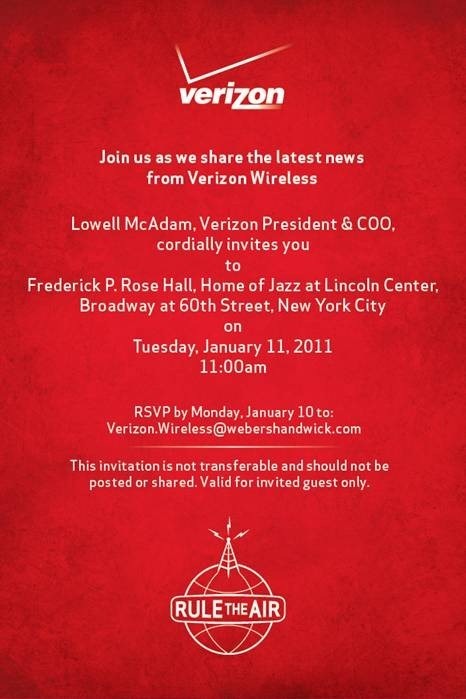 Well, there are lot of rumored that Verizon will launch their iPhone on 3rd February, But here what we have Verizon Wireless has just sent out invites for an event which they are holding in New York City on January 11, 2011. There’s been a Verizon event making the rounds—it’s next Tuesday, January 11th. The invite has been sent to MG Siegler of Techcrunch and Jim Dalrymple of Loop Insight—both pretty prolific Apple reporter/writers/bloggers/whatever. Gizmodo strongly feels that this event is indeed for the launch of the iPhone on the Verizon network.If there any announcements related to this, we will surely keep you updated.